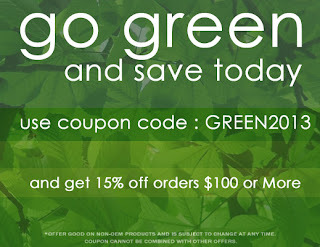 Green Savings Sale - Get 15% Off on Orders $100 or More | TonerGreen - Eco-Friendly Toners from the U.S.
TonerGreen, an environmentally-concious online store that has been providing environmentally responsible printing solutions such as eco-friendly toner cartridges and eco-friendly ink cartridges, will help you save on your printing expenses through its Green Savings Sale by offering 15% off on all remanufactured toner cartridges and ink cartridges orders $100 or more. 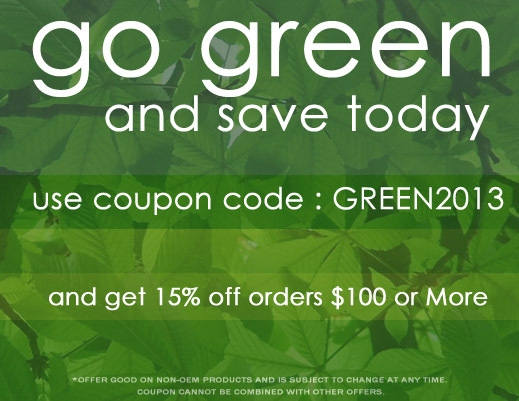 You can simply save on your order eco-friendly, U.S.-made remanufactured toner cartridges and ink cartridges by just typing in coupon code GREEN2013 at the designated coupon code box to be found at the checkout page. As always, orders $50 and up qualify for free shipping, thus with our Green Savings Sale, your shipping will be free as well. This promo is valid until February 12 and is not valid on OEM products nor be combined with other coupon codes or on-going promotions. Aside from our Green Savings Sale, we also offer a 15% off discount on orders $50 or more by simply liking TonerGreen's Official Facebook Fan Page and redeeming the special coupon code to get the discount. We also offer a 10% Off $300 Order Deal, an all-year around discount promo for customers whose purchased order will reach the amount of $300 or more. To avail this discount just use coupon code TENOFF300. Shipping is free, of course, in this promo. You can also check TonerGreen Coupons Page for more discounts and promos. Moreover, TonerGreen stands by its products, offering 2-year warranty on all its remanufactured ink and toner cartridges. This is because TonerGreen prioritizes our customer’s satisfaction. Our products are all eco-friendly, with the intention of contributing to energy conservation, sustainability, and environmental responsibility. At TonerGreen.com, we are not only a source of specialty products that contribute to energy conservation, sustainability, and environmental responsibility; we also intend to help you make eco-friendly choices for your home or office with the confidence that you are making a smart decision. So what are you waiting for?